PRODUCT DESCRIPTION: Clear rigid plastic square measuring 4.5" wide by 4.5" long and less than 1/2" tall. These traps work on silverfish, booklice, springtails, psocids and carpet beetle larvae. Each trap features a small organic food lure these three pests cannot ignore. Place it on bookshelves, pantries, closets, along baseboards and basically anywhere target pests have been seen. 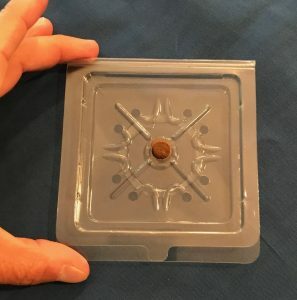 To properly deploy, you'll need to set them up with with the 8 little holes down. This is the actually the bottom of the trap. 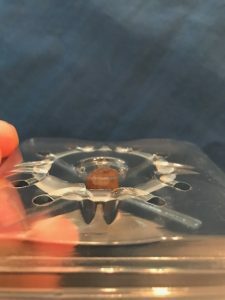 Target pests will enter by following the small grooves on the bottom side which lead to the holes and then inside the trap. Once they enter, they'll get stick to the non-drying glue which can remain active for up to 6 months. This is the bottom of the trap so be sure its facing the ground to allow target insects to enter. WHERE TO USE IT: Safe for use throughout the home in bedrooms, closets, pantries, under furniture cushions, around rugs suspected of having active insects and under beds. RATE OF APPLICATION: 2-3 traps per room with activity. In the open, each trap has an effective range up to 20 feet (10 feet in each direction). In a pantry or cabinet, this range will be severely limited so use more when making hidden or sealed placements. The glue will remain active for up to 6 months but traps should be replaced every 3 months. Be sure to replace filled traps sooner.